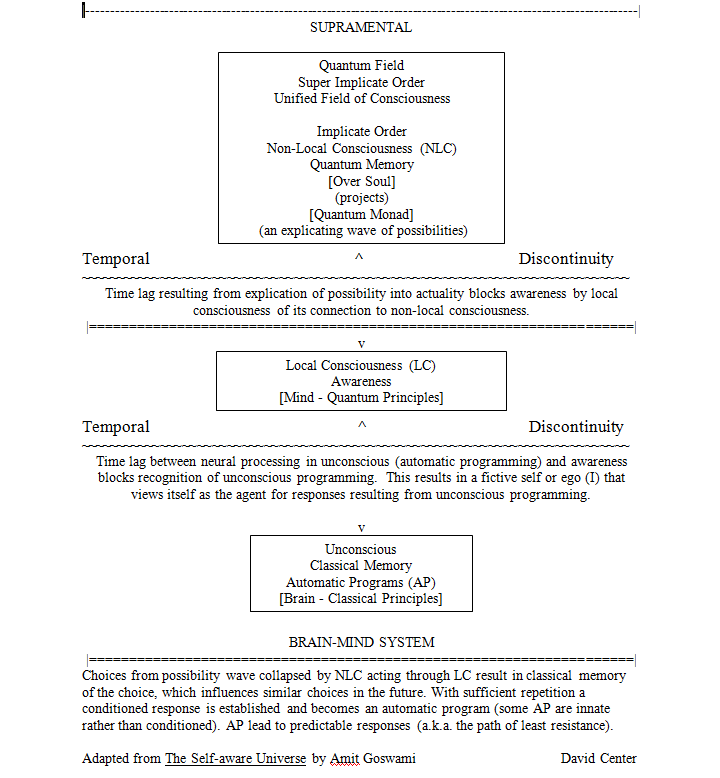 The outline of Goswami’s Brain-Mind model presented below doesn’t capture all of the nuances of the development that the model received in his book The Self-aware Universe. I have used a few terms, especially in the upper part of the Figure at the end, that he doesn’t use but that I think are comparable and to which he probably would not object. For example, he uses the term Unitive Consciousness and I used the term Unified Field of Consciousness (UFC). I have also used three terms that come from David Bohm’s model (Super Implicate Order, Implicate Order and Explicate Order). Bohm indicates that the explication of a collapsing wave of possibility by its unfolding from the Implicate Order (transcendent dimension) into the Explicate Order (material dimension) is what creates our perception of time. Since in Goswami’s model the transcendent non-local consciousness (NLC) is obscured from local consciousness (LC), I offer Bohm’s idea of how time is created as the basis for the temporal discontinuity that obscures the one from the other. Goswami does discuss a temporal discontinuity as being what obscures our unconscious programming from our conscious awareness so proposing a complimentary temporal discontinuity as the obscuring factor between NLC and LC seems reasonable and provides a certain symmetry. I have also included in the upper portion of the figure the term Quantum Monad (QM), which is a term used by Goswami but not until a later book (The Physics of the Soul, as I recall) and is roughly equivalent to what is often thought of as a soul. A QM is a possibility from a more complex set of possibilities which he refers to as a Bliss Body and I have referred to as an Oversoul (OS). If you think of the UFC (NLC, if you prefer) as a fabric then an OS is like one thread contributing to that fabric. An OS is too complex for explication into a single physical body/brain in the material dimension so a portion of it is explicated, i.e., a QM. Thus, LC can be thought of as a node of NLC that has its roots in the transcendent dimension but is generally unaware of its connection to the OS from which it is being projected, which in turn is an integral part of the UFC or NLC. The veil obscuring NLC from LC appears to me to be the temporal discontinuity created by the explication process. Briefly, as a QM and it’s physical host grow and develop it is presented with many situations and choices. These choices can be thought of as a wave of possibilities with varying probabilities of being chosen and thus collapsed into actuality. Some possibilities are more probable than others for a variety of reasons, including biological programming (e.g., an innate preference for a sweet taste) and socio/cultural influences operating from outside the individual nudging him or her toward particular choices (e.g., parental preferences). Choices have outcomes and if an outcome is rewarding the same choice becomes more probable in future situations in which the previous choice is present. On the other hand, if the outcome is punitive the choice becomes less probable. Eventually, a program based on classical memory and consisting of a type of situation, a choice and an outcome is created and becomes an automatic process that operates beneath conscious awareness. Thus, our life is shaped over time and eventually the vast majority of our thinking, feeling and behavior arise from automatic programs (APs) [see sub-section in Part I) that keep us largely on autopilot (some suggest as much as 99.99% of our activity is on autopilot). The choice made by an AP is what we sometimes refer to as the “path of least resistance.” Conscious awareness is engaged with dealing with those situations that arise for which we don’t have automatic programs with which to engage the situation. Conscious awareness also observes the thoughts, feelings and behaviors arising from the unconscious APs. There is a demonstrated brief time lag between the choice made by an AP and awareness of it and its execution. One effect of this temporal discontinuity is that conscious awareness begins to generate an explanation for why certain thoughts, feelings and/or behaviors are occurring. What evolves is a “fictive self” or agent that is responsible for these occurrences and constructs an explanation for them or one’s personal narrative. This agent is also referred to as self, ego and I. Thus, if one defines “free will” as the ability to make lower probability choices than the automatic and high probability choice that we would make on autopilot, then the most basic exercise of “free will” is the ability to say “no” to an AP choice arising from the unconscious. One obstacle to doing this other than the effort required is that often the time lag between decision and awareness is so long that what amounts to a reflex response occurs coincident with awareness. Goswami suggests that one effect of meditation practice is that this time lag diminishes and the temporal discontinuity obscuring one’s AP from conscious awareness is weakened. The other effect at this level is that sitting quietly and allowing thoughts and feelings to arise into awareness and pass through provides practice in not reflexively acting on such thoughts and feelings. Goswami likens a thought to a quantum object. One can focus on and follow a thought and observe its path or one can focus on its content and explore the richness of its content but one can’t do both at the same time. Thus, a thought can be compared to either a wave form or a particle form. In meditation, one attempts to develop skill at avoiding following or exploring the thoughts and feelings that arise into consciousness. Thus, systematic application of meditation to develop local consciousness helps one acquire the tools needed to be less of a victim of AP and more deliberate or mindful about one’s choices. Meditation can also help one bridge the temporal discontinuity obscuring LC from NLC. By learning to deliberately minimize one’s attention to stimuli generated by both AP and the external situations that activate them, it becomes possible to more easily access NLC. One effect of this is to open the doors to a more creative life since NLC contains infinite possibilities although with limits on the degree LC can engage them. Goswami suggests that Jung’s collective unconscious is an aspect of NLC and that the archetypes (defined as quantum objects) that are available therein constrain the infinite possibilities to a set available for exploitation by humanity. These constraints on possibility along with constraints on choices shaped by biology, language and culture are what create the consensus reality that permit a sense of shared experience. Personally, I view consensus reality at its broadest as a “fictive self” for the species and somewhat more narrowly as a “fictive self” for any given society. Finally, weakening the temporal discontinuity between LC and NLC also opens up the possibility of direct experience of the UFC, which many mystics have described as experiencing the unity of all things or merging with the mind of God.